Dessign.net was founded in 2000 and since then, the WordPress themes from their collection have been installed by over 97,000 users. Dessign currently has over 120 WordPress on offer and these templates can be purchased individually or as part of their competitively priced all themes package. The themes from Dessign are aimed at creative professionals and those who appreciate more minimal and clean designs over the all singing, all dancing modern multipurpose themes that are popular today. If you want the focus of your website to be on your work, rather than on the theme, the Dessign themes could be just what you are looking for. 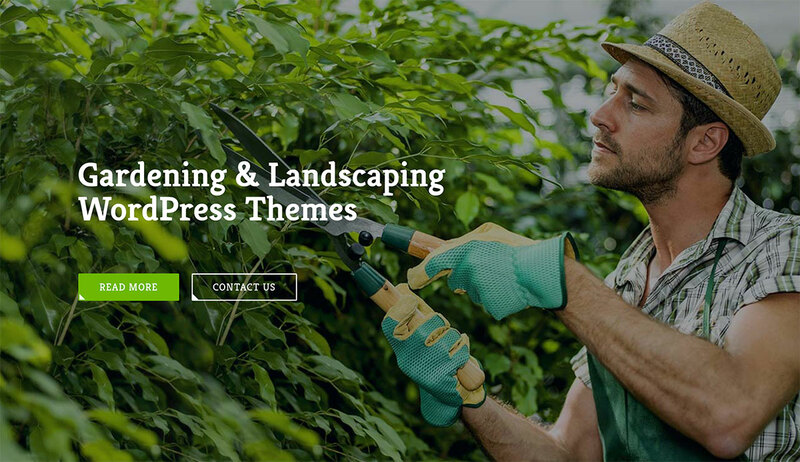 In this Dessign WordPress theme shop review, we’ll be exploring a few of the most popular templates from their collection, before taking one for a test drive to see how easy it is to use. By the end of this review, you should have a good idea of whether the themes from Dessign are the right choice for your project. This responsive WordPress theme features a homepage slider that does a great job of displaying your best content to new visitors. The overall design of this theme is best described as stylish, clean, and minimal. 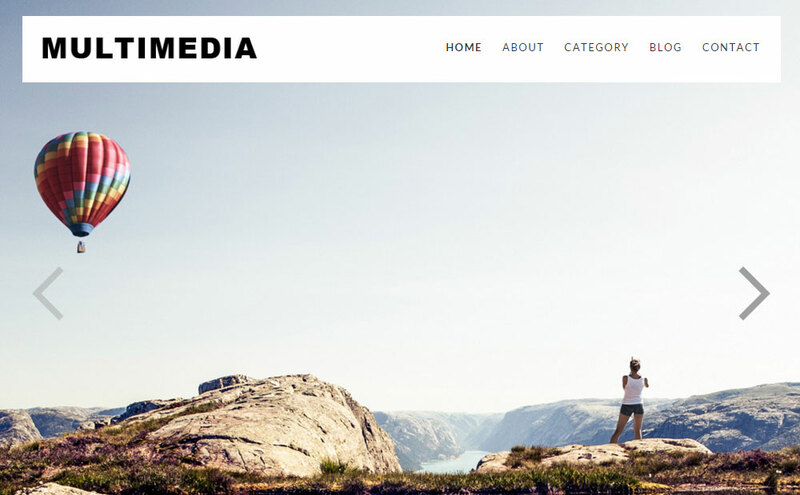 The Multimedia WordPress theme would be a great choice for promoting a creative agency or the services of a freelancer working in one of the creative industries. However, to ensure your site doesn’t ever look boring or bland – which can sometimes happen with the more minimal WordPress themes – Multimedia makes use of some subtle, but eye-catching, animation effects to help draw visitors towards the inner content of your site. Multimedia works equally well on mobile devices as it does on desktop computers, therefore, no matter who your target audience are, they will have no trouble accessing your website. 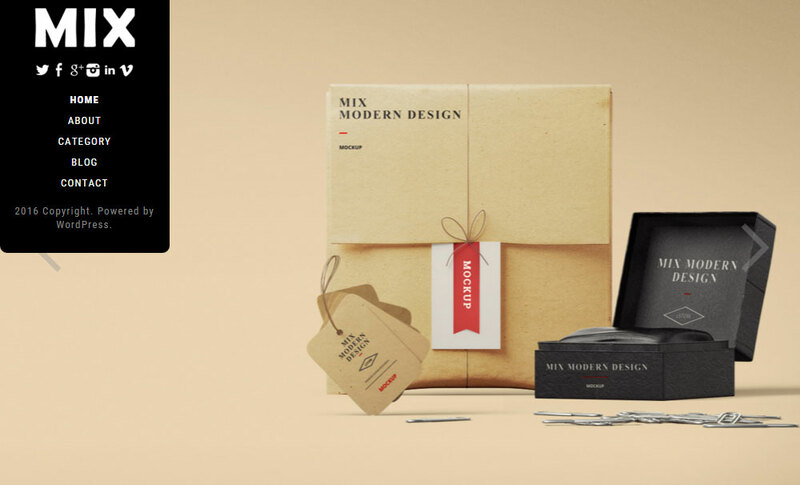 Mix is another best-selling WordPress theme from Dessign. It’s a great choice for creating the website for a digital studio or design agency. However, its clean looks can easily be used to promote almost any type of project or online content. This theme includes a fairly unique fixed sidebar menu, which makes it very easy for your visitors to find their way around your site, no matter where they are on the page. 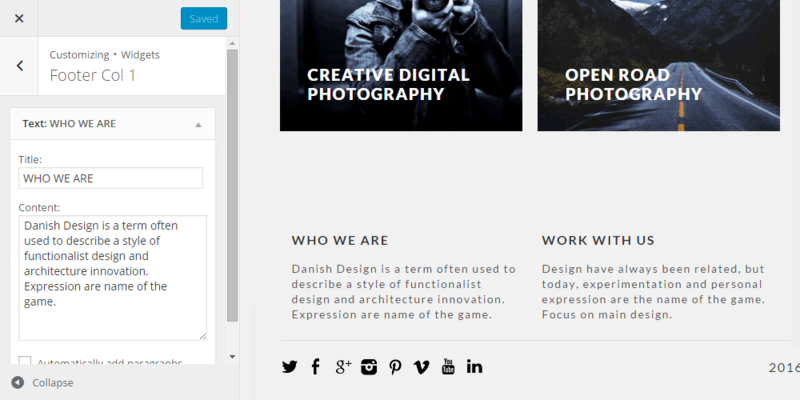 The blog post layouts are also very clean, allowing your content to stand out on the page. The Mix theme includes a fully mobile responsive slider tool that gives you an effective way to share your best content on the homepage of your site. 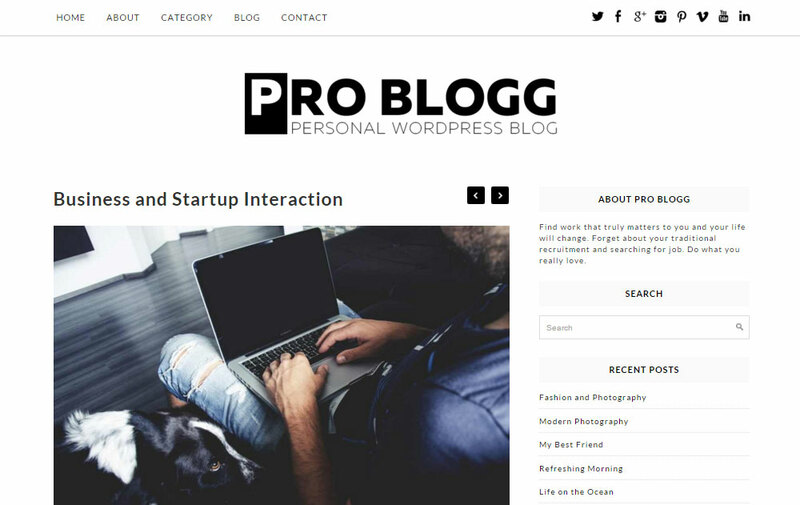 The popular Pro Blogg theme is a great choice for bloggers and anyone looking for a template that will let their content take center stage. Depending on how you set this theme up, your homepage could feature a large carousel that displays the latest content from your blog. Once a visitor clicks through to an individual blog post, they have the option of continuing to scroll through the published content on your site after they’ve read the post. Through the widgetized areas of the theme, such as the sidebar and the footer, you can easily display links to the other content on your site or use these spaces to display any custom content you like. 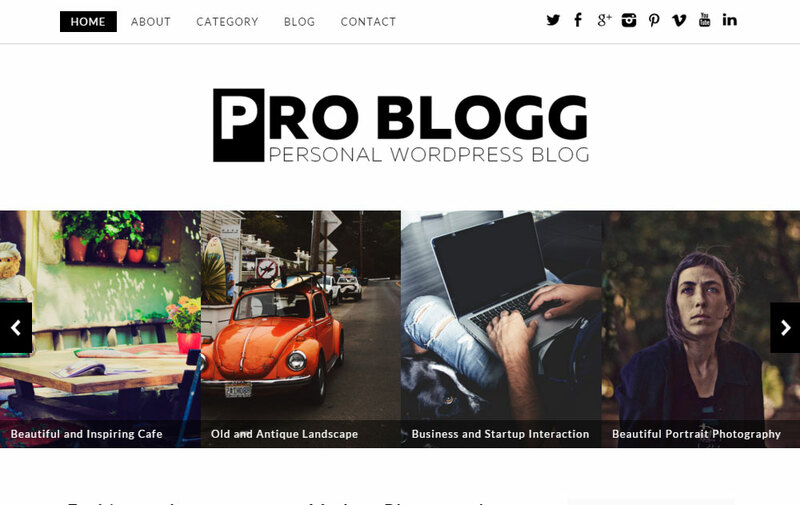 With Pro Blogg you get access to a stylish and contemporary design for your blog, with plenty of nice little features that will help make your website more appealing to your visitors. If you’ve been to any modern website in the last year or you’re an old school 2D gamer, then the parallax scrolling effect is something you’re probably familiar with. 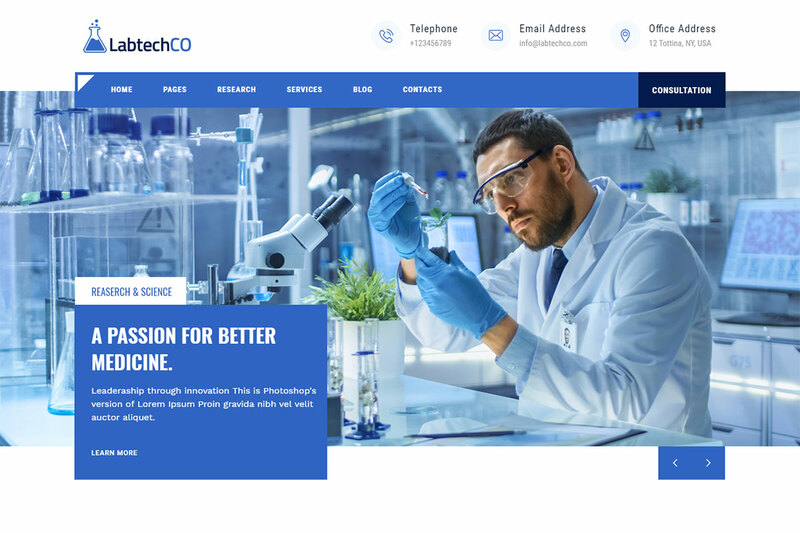 As the name suggests, this theme makes extensive use of this effect, helping to add some depth and animation to your website. 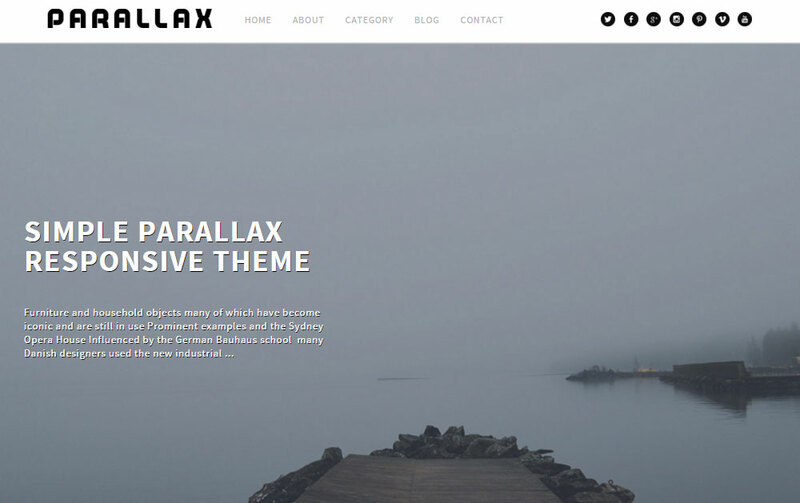 The homepage design of the Parallax theme can accommodate a vertical list of full-width images, making it a great choice for photographers or other visual artists with strong images to share. 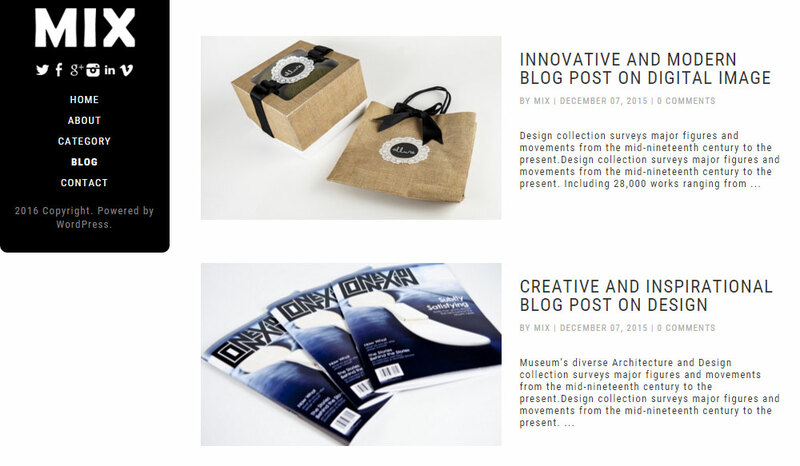 Each image can include a title and link to an inner page or blog post on your site. With a bold design and prominent social media icons, this theme is a good choice for those who specialize in working with images in a range of formats. Sell is a WordPress theme that has been created to help you build an online store or sell products from your blog or website. The Sell theme includes full support for the free WooCommerce plugin, the e-commerce toolkit that powers almost 10% of all online shops. Depending on how you set up your store, Sell gives you the option of displaying a full-width slideshow on the homepage of your site. This slider can be used to promote either content from your blog or products from your store. 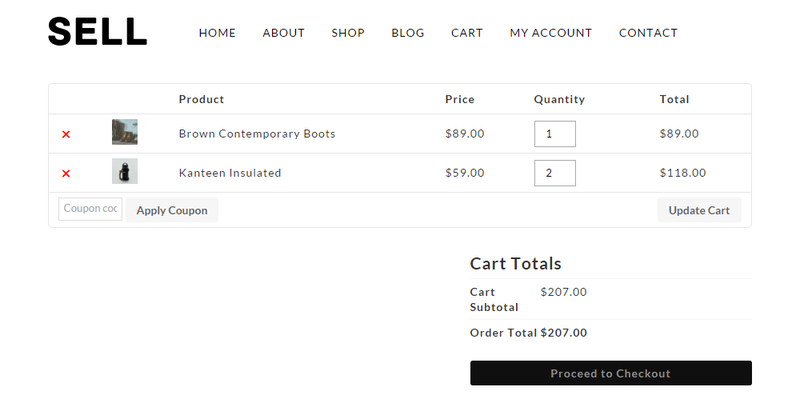 Clicking through to the individual products listed on your site allows your visitors to view the product images, read the description, and if they wish, add the item to their shopping cart. As this theme is fully compatible with the WooCommerce WordPress plugin, all of the store pages on your shop, such as the shopping cart and checkout pages integrate seamlessly with the rest of your content. If you want to build a simple and minimal online store with WordPress, the Sell theme and the WooCommerce plugin provides you with everything you need to start your very own e-commerce venture. 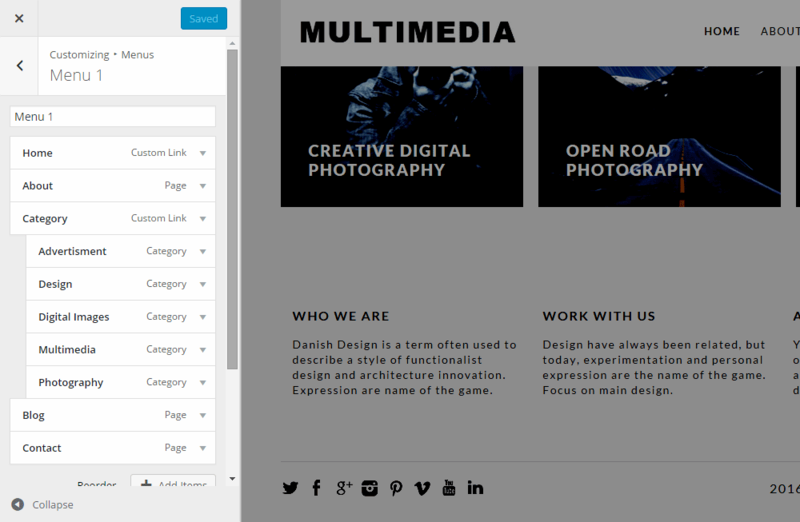 As mentioned, Multimedia is one of the most popular WordPress themes available from the Dessign team. It has a fully responsive mobile friendly design and layout. It’s a great choice for promoting the services of anyone working in the creative industries. However, while the appearance is up to scratch, how easy is it to actually build a website with? Let’s look behind the scenes and see what Multimedia is like to use from a site admin perspective. After all, if you can’t set your website up how you want, or keep it running smoothly, your site won’t become the effective marketing tool you were hoping for. After downloading the theme files from your Dessign account, and then uploading them to your WordPress website, you can activate the theme through your admin dashboard. To get started with setting up your website, you can click on the customize button to launch the WordPress Theme Customizer tool. 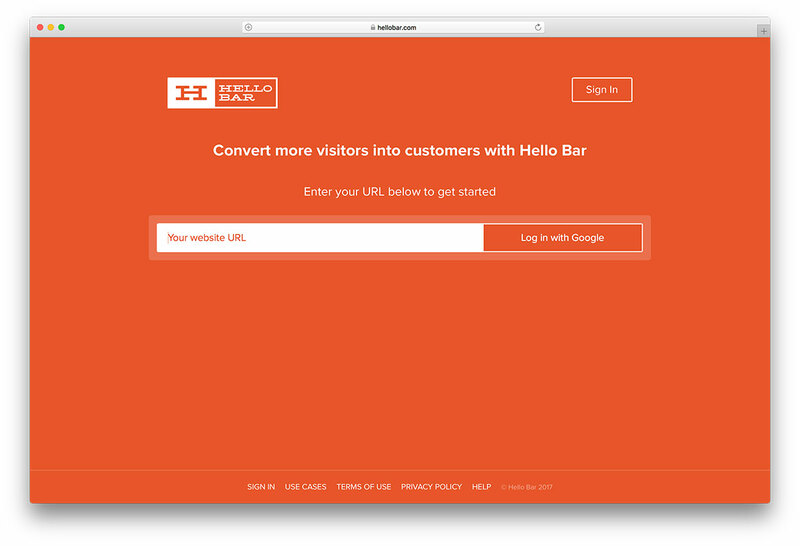 The Customizer gives you a live, front-end preview of your website. The controls and settings allow you to make changes to your site, with the results displayed in real time. This is very convenient as it speeds the customization process up considerably, as there is no need to switch browser tabs and refresh windows in order to see what effect your changes have had on your site. As the Multimedia theme features a widgetized homepage, adding content to this part of your site is very straightforward. After navigating to the widgets section, you can open any of the widgets and enter the content you’d like displayed on the homepage. As you can see, editing the text on the homepage of your site is just a case of navigating to the corresponding area of the Customizer, such as the site identity section or a specific widget, and then entering your content. The method for setting up the navigational menus of your site follows a similar approach. 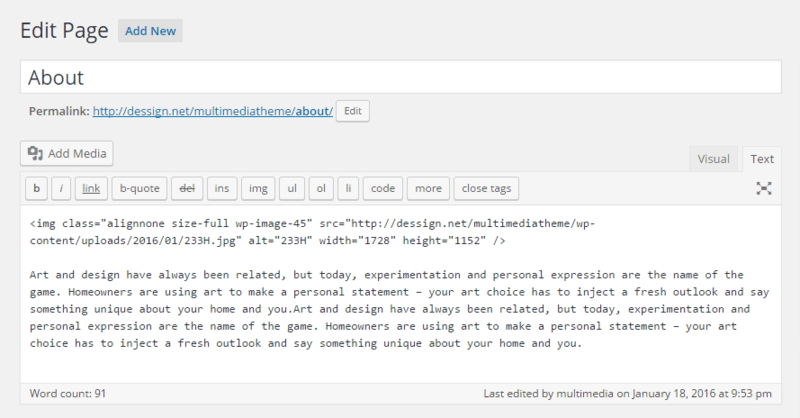 Simply head to the menu section of the Customizer, then choose which content you’d like to link to from your menus. When it comes to adding content to your site, such as blog posts and pages, the standard WordPress editor is used. The lack of a sidebar by default means that blog posts are displayed in full-width mode. The benefit of this is that your content will receive all the attention from your visitors, without any unnecessary widgets to distract them. The featured image is displayed below the blog post title, giving you a good opportunity to catch the attention of your visitors with a strong image and draw them into your content. As you can see, using the Multimedia theme is very straightforward. You can quickly add content to your site without having to worry about navigating a wealth of settings and custom options. This makes the WordPress themes from Dessign ideal for those who prefer a more simplistic approach to blogging and website management, as well as those who are new to WordPress and all of its little idiosyncrasies. If you just want to get a stylish, modern, and responsive website online as quickly as possible, the WordPress themes from Dessign come highly recommended. 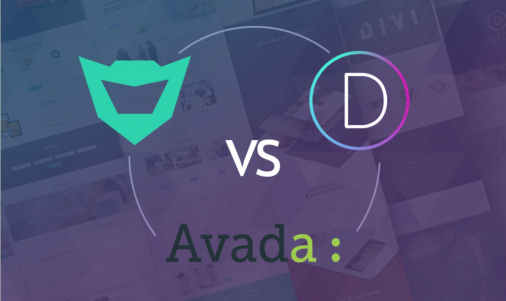 Although you can purchase any of the commercial WordPress themes from Dessign for $39, the better value option is to pay $99 for access to their library of over 120 themes. This is a one-time fee and includes lifetime access to theme updates and customer support. You can also use any themes you purchase on as many sites you as wish, helping to make this package a great deal for web designers who are building sites for their clients. 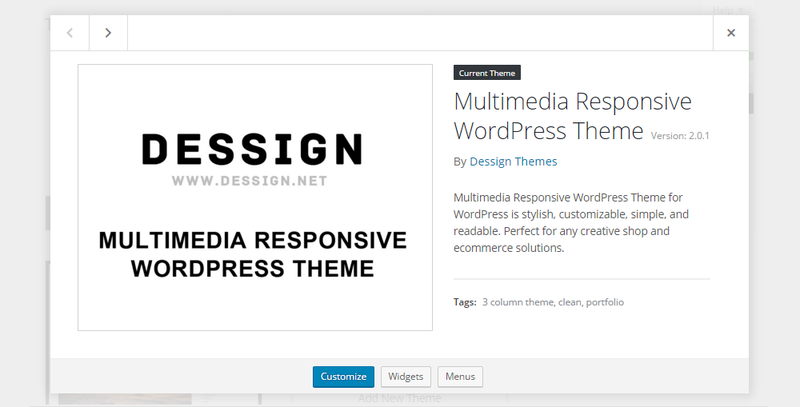 As part of their service, the Dessign team will also install any theme you purchase on your WordPress website. This is another reason why these themes are ideal for those with limited time or who are new to WordPress. There’s also a full money back guarantee on offer if you aren’t happy with your purchase. Therefore, if you like what you see, there’s really no reason not to give the themes from themes from Dessign a try. 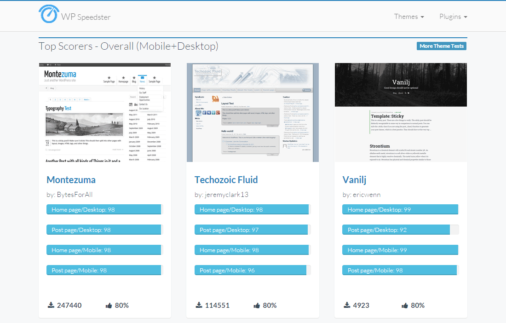 There are plenty of Dessign WordPress themes to choose from. Their collection covers a wide range of website types, from simple blogging templates and portfolio sites, through to agency websites and e-commerce themes. The Dessign themes all share a common look and feel, making them an ideal choice for those who prefer more simplistic and minimal website designs, rather than overblown and feature-rich themes that include all the latest bells and whistles. However, by choosing a Dessign theme, you aren’t limiting the functionality of your site in any way. You’re still free to install any of the free and commercial plugins available for WordPress. This allows you to add more features to your website on your own terms, rather than being dictated to by the developer of your chosen theme. If you like the look of the themes from Dessign, then you’ll be pleased to hear they are easy to use, offer great value for money, and can be used to build a wide range of websites with WordPress. What do you think of the themes from Dessign? Which one is your favorite? Would you use these templates on your next webstie project? Please share your thoughts in the commments below. Thank you for your recommendation, you helped me a lot choosing the right theme for my WordPress blog. I’m really surprised to find good reviews about Dessing.net, their themes are the wrost coded I’ve ever seen. Even the HTML tags are not closed correctly in several of their themes. Definitely is not a company in which a webmaster can trust.